I have not been able to find a bumper that I love. The problem here is that I couldn’t just find a ready-made crib set that I loved. I wanted something more modern and that didn’t have modes of transportation or animals all over it. Evidently that’s a hard thing to find when it comes to boy bedding. I went out on my own and fell in love with this fabric for a crib skirt and this sheet. I really want a plain linen colored bumper but have had zero luck finding one. 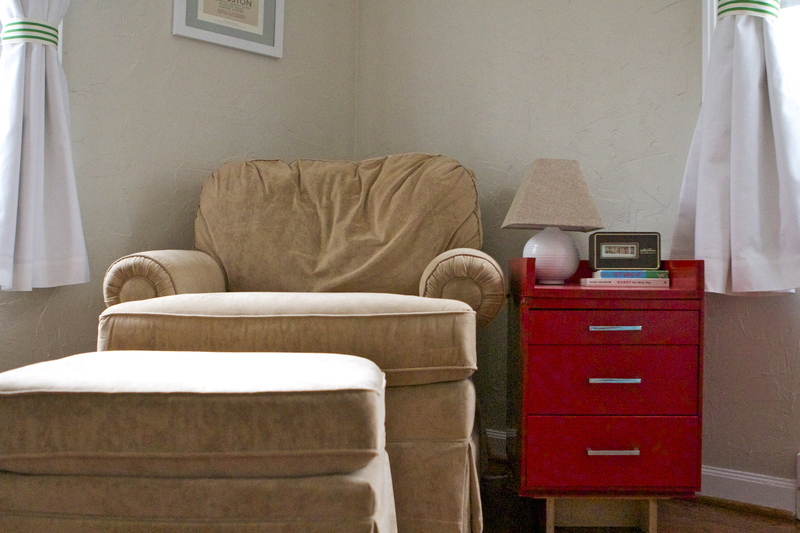 As for furniture, we re-used Arle’s crib, rocker, and ottoman. 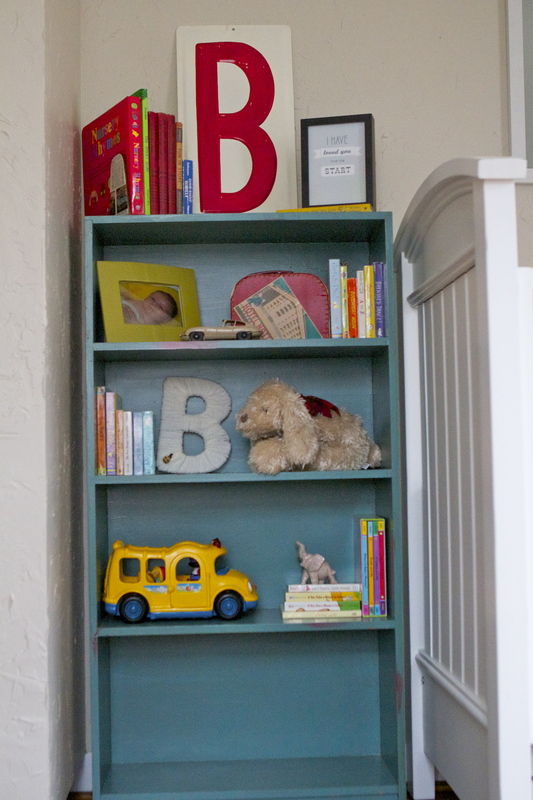 The bookcase, changing table, and side-table were all found on the most productive flea market excursion EVER. Bethany and I both came home with major First Friday loot on our latest adventure down to the West Bottoms. In order to give you the best view of the mostly-finished product, Bethany brought her fancy-schmancy camera over to take pics of Boyd’s new digs. She’s too good to me. The prints above the crib are from the calendar Trav and I had back in 2004. 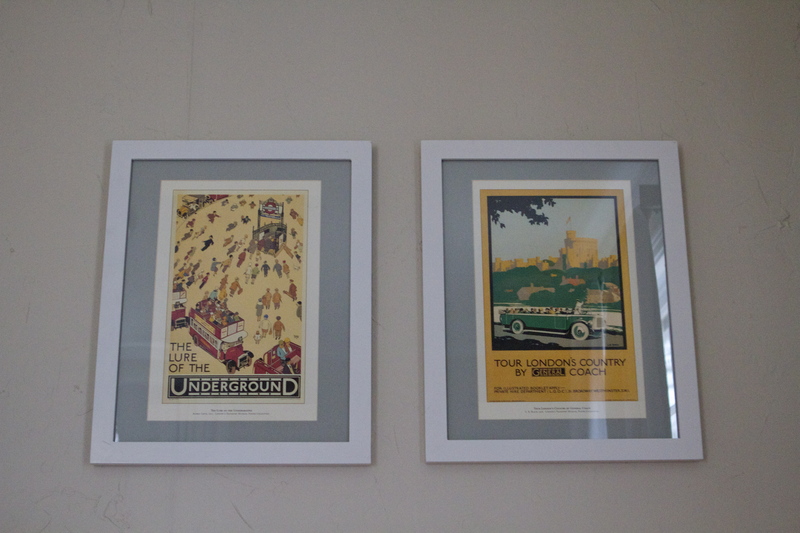 They’re advertisements from the London Underground and we’ve held onto them all these years just waiting for the perfect place for them. 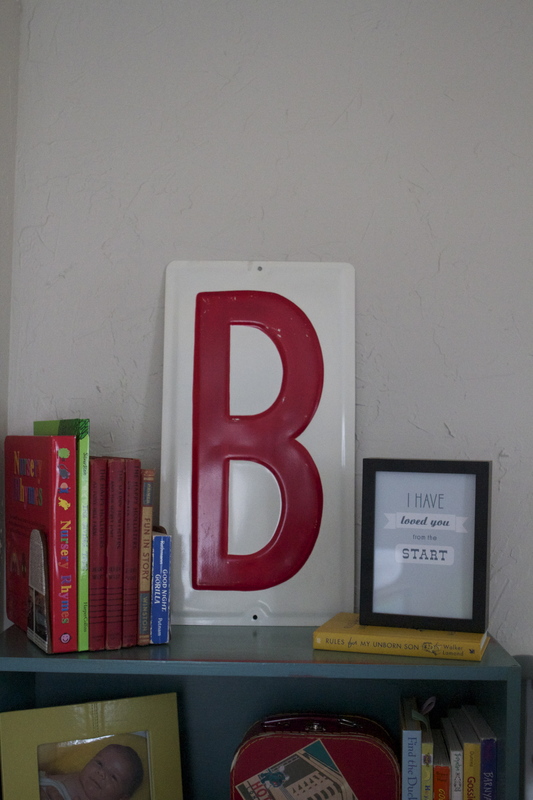 The large red “B” came from Stuff in Brookside here in Kansas City. The adorable “I’ve loved you from the start” print was a gift from our sweet friends, Laura and Eric. 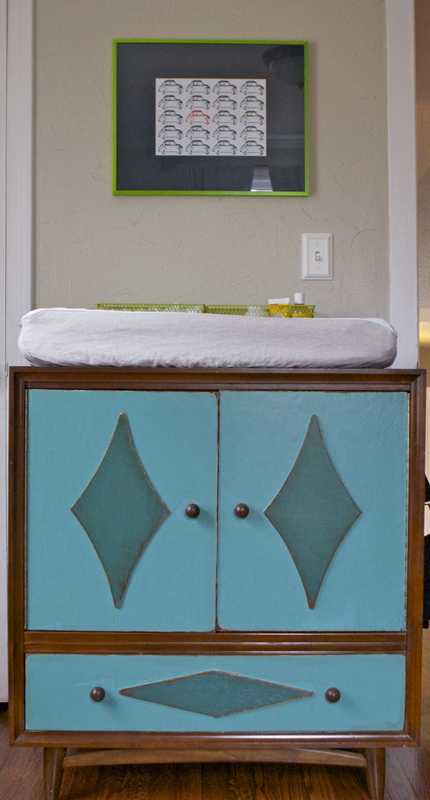 The car print above the changing table is from this Etsy shop. I put it on my Christmas list and my awesome bro-in-law came through with it. Thanks, B.
I’m OBSESSED with boyd’s room. Obsessed. It’s perfect. I can’t wait to see that sweet little boy in his room=) Would you tell him to get here already?! PS: whenever baby good #2 joins the family, pretty sure I’m going to need you to come down to t town and help me decorate the nursery! Super cool room! Can I sleep there? Love this. Come help me with the Cameron and Henry’s rooms please. I will hold and rock Boyd for you. 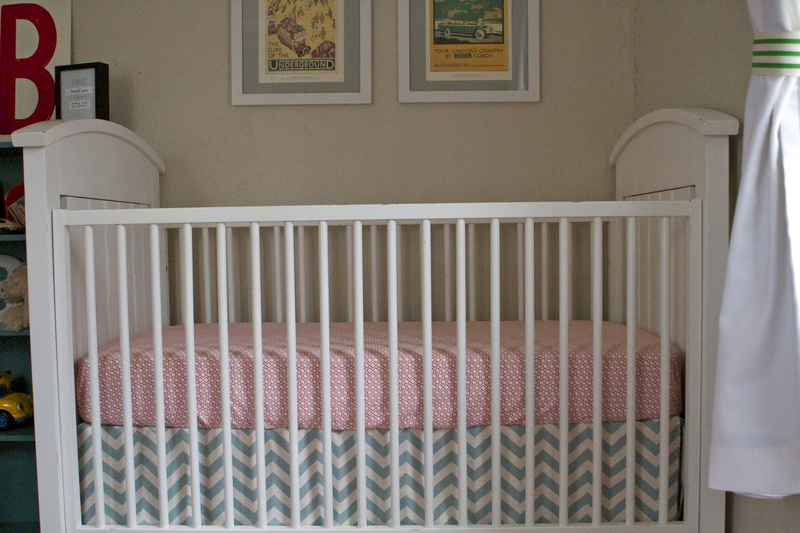 LOVE LOVE LOVE the nursery. I can’t wait to rock little Boyd in his awesome room with my sweetie Arle snuggled up next to me in the rocker :) The thought of that just makes me beam!! the nursery for boyd looks amazing!! you did such a great job putting things together! I love it! Looks great! 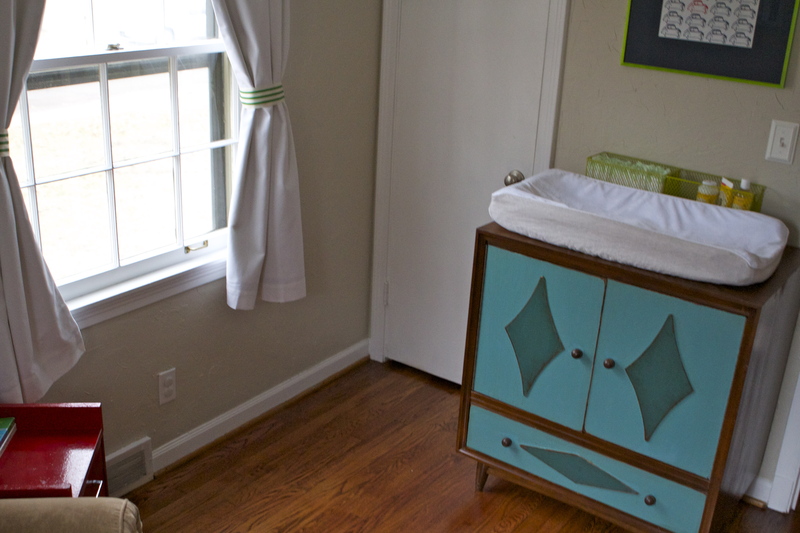 Love the London prints and the changing table! Can’t wait for him to get here! Looks great…so glad you gave us a peek! I agree with your Mom just a little someone missing…can’t wait!! LOVE the nursery! It is quite a challenge to make a non-theme-y baby boy nursery and you definitely rose to that challenge!! Everything looks so great! Heather, have you heard of the ‘The Baby Guy”? He makes custom bedding. You pick the fabric and all. What an awesome room for Mr. Boyd to come home to, love everything you did, wonder what it will look like the first day home! 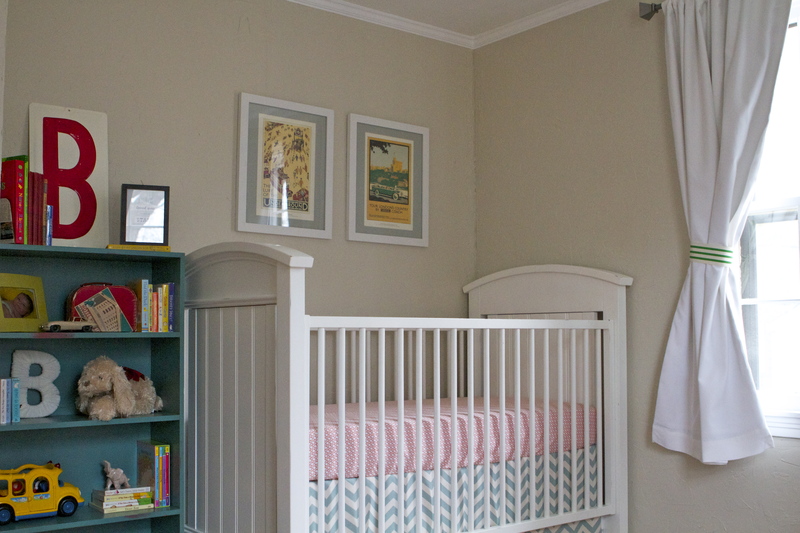 yep, this is the most adorable nursery for him to come home to!